This chair was developed to be ergonomically sound, functional, and durable. The backrest is 14 1/2” w x 9 1/2” h, with lumbar support and plastic protective panel on the back and edges. The concave upholstered seat is 18 1/2” w x 16 1/2” d x 3” thick, features an internal bumper guard to protect edges, and is fully adjustable from 24 1/4” to 29 1/2” h. This helps ensure a proper fit for varying body sizes and types as well as easy adjustment to tasks performed at different work levels. 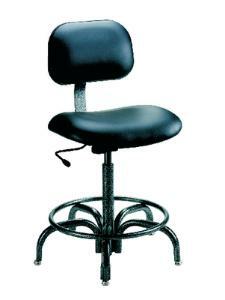 Stands on a 5 legged tubular base with 22” leg spread and 18” diameter foot-ring. Glides are nickel-plated. This is furniture that looks goods, and provides comfort and durability without sending your budget into shock.